My answer is always the same: We can be certain the crisis is coming and can estimate its magnitude, but no one knows exactly when it will happen or what the specific catalyst will be. The second part of my answer is to prepare for the crisis now. When it happens, it could unfold very quickly. There may not be time or opportunity in the middle of the crisis to take defensive measures. The time to prepare by increasing allocations to cash and gold is now. With that said, it is useful to keep a list of the 10 most likely flash points and to monitor events in each one as a way to improve one’s chances of seeing a crisis at the early stages. 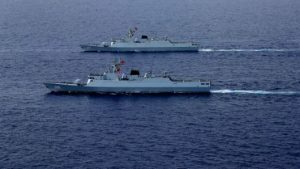 This article serves as a reminder that one of the most dangerous hot spots in the world today is the South China Sea. There are six countries with recognized claims to parts of the South China Sea. Yet China itself claims the entire sea except for small coastal strips and claims all of the oil, natural gas and fish that can be taken from the sea. China has ignored international tribunal rulings against it. The U.S. is backing up the other national claims including those of the Philippines, which is a treaty ally of the U.S. China has built small reefs into large artificial islands with airstrips and sea bases to support its claims. The U.S. has increased naval vessels in the area to enforce rights of passage and the equitable sharing of resources. Both sides are escalating and the risk of a shooting war or even an accident at sea is increasing. The South China Sea is mostly out of the headlines at the moment, but it bears watching as a possible catalyst for the next international crisis with global financial implications.